Thoughts: So excited and overjoyed this week! We found out the gender of our sweet little baby on Monday and I cannot wait to share with you all (be on the lookout Saturday!). Even though there are only two options, duh-boy or girl, I was still so shocked and happy when doctor told us with 100% certainty. We can now start envisioning our future with our little baby! 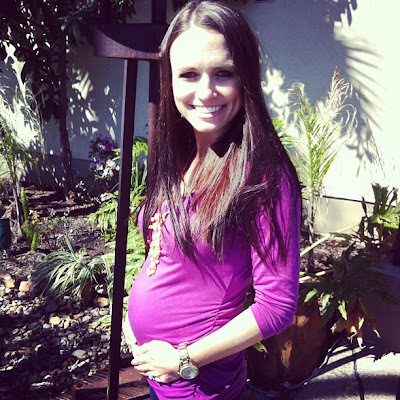 Baby: baby is growing like crazy! About the size of my open hand and weighing 5 ounces. Baby can start recognizing and hearing barking dogs, doorbells ringing, etc. He/she is practicing its suckling and swallowing skills and empties its bladder every 45 minutes (sounds like mom!). Weight: up 5lbs from my 6 week appointment and right at my pre pregnancy weight (thanks to morning sickness, I lost a lot). I hadn't been gaining it the past few weeks so I was excited to be up! Symptoms: unfortunately still on Zofran. I've been playing around with the dosage and am taking 1/2 a pill in the morning and 1/2 at night. I tried to skip my night pill last weekend and baby wasn't having that. Doctor said I should see relief after 18 weeks when hormones drop. Honestly I am okay with taking it until I am 100% because it is safe for me and baby! To add to the awesome (sarcastic) symptoms I've already had, bloody noses have appeared this week. Monday morning I was woken up to one at 6am that wouldn't stop for 40 minutes... and Jon's fever was breaking so it was interesting haha. I've also noticed some red spots on my cheeks...they aren't sticking up like normal acne would but definitely a pregnancy thing. I have been lucky to not ever experience acne (with the exception of 1-2 spots a month on my period). I've been having some back pain on my left side and occassionally it wraps around to my tummy. I broke my back (T11, T12, & L2) 10 years ago so I am not surprised by this back pain! Sleep: I've kissed getting 8 peaceful hours of sleep goodbye. I am officially not supposed to sleep on my back anymore and I find myself tossing and turning and waking up to move to get comfy. I am sleeping with a pillow between my legs which has helped a lot. But as far as tiredness goes, I am feeling great! No naps, not feeling tired or sluggish. Cravings/aversions/eating: my appetite is pretty much back to normal, thank the Lord. I am finally craving meats and lots of fruit. I feel like I am starving yet get full so easily. And then am starving an hour later. Workouts: same last last week, weights 2-3 times a week and a few long walks, etc. It's been harder to bend over and I am definitely not as agile as before. Clothes: as you can see in the picture above, I am still rocking the rubberband trick to allow me to wear my non maternity pants. I love my maternity ones but didn't want to wear them every single day. I've worn a few maternity tops but for the most part non maternity still fits and shows off the bump. Doctor appointment: 16 week appointment was wonderful on Monday! Not only did we find out the gender but confirmed that baby has all 4 chambers of it's heart, 2 sides of the brain, and full lips (no hair lip). Baby measured a few days early and was VERY active! We may be biased to think our baby is super cute but the nurse was telling us how beautiful it's profile was! Random: I didn't mention this last week but Jon was supposed to fly out Sunday for work and not return until Friday and my mom was going to go with me to the doctor. My entire family will be in town Friday and my parents are having their 50th birthday party so we really wanted to be able to share the gender. I was sad but knew it wasn't the end of the world but by only the grace of God, Jon's schedule shifted and he was home Monday!! I couldn't have imagined it any other way and it was an incredibly special day/night for us. Rocking the bump after gorging myself on all you can eat filet! Congrats on finding out the gender! I was a little worried he/she wouldn't cooperate and they wouldn't be able to tell-I've heard of that happening before! Also, thanks for mentioning Very Jane ...I'm obsessed with their products now and have signed up for their daily emails. Dangerous! Ruthie! You look absolutely gorgeous! Pregnancy is SO becoming on you! I can not wait to read your gender reveal post! Very exciting news. Can't wait to find out the gender, I know you must be excited and anxious for all to know! I had 3 boys and with two of them I craved nothing but fruit ;) Can't wait to hear what you are having!! And again, that bump is the best! There's no rubber band trick happening in my life anymore! You look so adorable! I didn't even pop until almost 20 weeks!!! So I'm jealous you got to rock the bump early :) Can't wait to hear if it's baby girl or baby boy Hart! Ah! So excited for babies! YAY!!! I cannot wait until Saturday!!! A friend told me to set up an email address for my baby and start sending letters, photos, thoughts, etc to him/her. I passed the email address along to the Grandparents too. My little boy is now 5 months old and I opened up his email yesterday and was overwhelmed with love. My husband even wrote him a quick note while he was sitting next to me when I was in labor that put me right back to that day. His Grandma's send him little letters all the time too. Something he may not cherish for a long time, but it's priceless in the end. So exciting! I can't wait to find out what you are having! 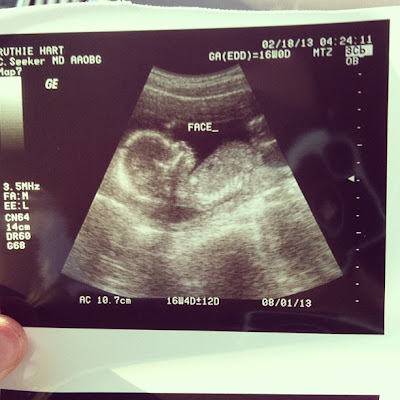 It really is the best feeling to know everything is healthy with the baby...finding out the gender @ the ultrasound is one thing...but know that it has all the correct human organs, parts and in the right places is a huge blessing! 18 weeks was my magic number with both pregnancies! Hope it is for you, too. Sweet relief. Can't wait to hear what you're having! Love that little baby profile in the ultrasound and glad your little one cooperated so you can tell what y'all are having! Can't wait to find out! i agree... adorable ultrasound photo!!! beautiful! Awh it has the cutest little nose. Cant wait to find out the gender!! Looking better and better each week! Also I love your Valentine's Day dress. You looks so festive and pretty! I got bloody noses nonstop because of lovenox during my pregnancy. Take the inside of your thumb and press to the side of your nose/nostril that is bleeding and hold for a few minutes. Worked like a charm. I had a few hour long nose bleeds that freaked me out until I did this. Good luck! I'm really loving these updates Ruthie. Gives me things to look forward to, and be aware of when my time comes. You're looking adorable as always! I am so excited for Saturday morning to find out the gender of your baby!! You are just so adorable !! - You just glow with pregnancy!!! Hope things start looking up for you to get off the meds & nose bleeds stop!